I am picking up a 1977 280z in Southern California and driving it back to Sacramento. The Z has less than 30k miles, new tires, pass smog, new fuel pump, and tune up within the past 6 months. I am planning on rental a car and driving down with my fiance. Then we will be dropping off the rental in SoCal and driving the Z back up. Is there anything you recommend we bring with us? What do you suggest we do maintenance wise once we get back home? Loaded question. Tells us more? How much has this car driven recently? Is it a reliable driver or been sitting and just runs. You could end up on the side of the road overheated and be in a pickle. Personally, I’d probably rent a unhaul trailer and find a truck or suv with a towing package. I’m at a pint in my life that I don’t take risks like be stranded on the road. If the car has been a reliable daily driver you’ll probable be okay. Check all the fluids before you pull away, put fresh gas in and have a mental backup plan. If you need to be at work the next morning maybe give yourself some extra time. A Uhaul might cost $75. You surely know someone with a truck in Sacramento. Putting a car that’s not been a daily driving on a 6 hour journey might be a bad idea. So tell us something that instills confidence. I am picking up a 1977 280z in Southern California and driving it back to Sacramento. Is there anything you recommend we bring with us? That's a serious drive in an unproven old car. Have it checked by a mechanic when you get back to Sacto. Good luck! Consider renting a truck and trailer in SoCal and hauling it back. It's not as much fun as driving a Z, but if something breaks down, the rental company has to fix it. Penske and Budget are better options than U-Haul IMHO. yep, that's a haul for and unproven car. I had a alt go out on mine, taking out the electrics, then there was the water pump, both of those can get you. At the very least if you must drive it, with the engine off see if the fan will rock showing play in the bearing. Bring some water and bars leak stop incase the rad springs a leak. oh and the most important thing, a fire extinguisher. Start the engine and look for fuel leaks around the hoses. If the hose are OE, then you are likely to spring a gas leak, don't want a fire ball on your hands. I purchased my Z in NJ but live in OH. I was planning on driving the Z back to Ohio but was convinced to tow it. It turned out that the clutch was on it's last leg and it never would of made it. You cannot assume the seller knows of hidden issues. There are so many things that could be a problem. Get a truck/trailer or be prepared to have it towed 300 miles. Don't forget to call Hagerty to get it insured. I bought my ‘75 280Z in NorCal (Petaluma) and rented a truck & trailer to bring it home to SoCal. The car was driveable, but I didn’t want to take a chance, hoping it would make it home without drama. Towing it home worked out perfectly. Good luck and congrats on your new Z! I vote for go for it. Watch the gauges. Don't let it overheat. Make sure the alternator is charging. Stop and check fluids every hour or two. It will be an adventure for you and your future wife. Stories... Too soon to be mundane. No offense to the cautious folks. There are probably some Z oriented shops along the way. Get their info and make the trip during business hours. I'd try driving it if looks roadworthy and it's been driven recently. A shop manual, basic tool kit, mechanics wire, and duck tape should get you back to Sacto. If it hasn't sat for any length of time and is nearly a daily driver I would go for it. Just bring some tools and all fluids just in case, plus what everyone else has said. Do you have pics of it? Sometimes pics may show a different story. I would imagine you are taking the interstate 5 or 99. If it were the 101 you would be passing thru Ventura and could make it a pit stop. We could check things out before you made the 400 mile trek, as long as I'm in town then. I have three zcars. With each, my dad and I took a flight to the car and drove back to Atlanta. My dad and I had a great time along the way each time. Two of the three had mechanical issues that we had to deal with along the way though. Still...I would do all three again. First car was in Portland. Second car was in Phoenix. Third car was in Hershey PA. Each time we packed a suitcase of tools and a few spare parts. There was a long arse night in a pretty bad hotel in Midland Texas though. Car was running terrible. Fortunately a spare AFM for a 280 came in handy the next morning. I would say though...I would not attempt if the car didn't start, drive, stop, etc well enough when I tested it out in person. Because of the questions I had asked prior to the sale though, I felt good about being able to fly out and drive home with parts and tools. If the car didn't check out in person I would have made arrangements for transport...uhaul and rental, or transport company and fly home. Bring a tool box full of metric everything. Maybe bring an entire gasket set, just in case of a failure, a shop in BFE might be more inclined to replace something if you present the parts. Bring a jack, and some jackstands. I would replace all the fluids when I got back, even if they were replaced just before the trip. Check the spark plugs once home, and begin surveying your new sickness. I would say go for it. If it craps out, it would probably happen early when you'll be in LA, with plenty of services around. Take it easy over the Grapevine, and it's all downhill from there. If it truly has less than 30K miles, then your chances for success go up. Do you have the documentation to be sure that it's not 130K, or 230K? I say go for it! Bring tools and check fluids/belts before leaving. Get a AAA premiere membership, and if something goes wrong you could get towed up to 200miles. I purchased and drove my '75 from Auburn to LA back in 2007. I didn't trust the car 100% to make it up over the Grapevine so I went by way of the 58 to the 14. It's longer by a good amount but not as steep. Something to consider. Drove mine from Tennessee to Chicago in the middle of the night. Go for it, but check for fuel/fluid leaks before you go, watch the charge and temps. Great way to know the new Z. Maybe get haggerty insurance beforehand so you can get it towed to the house if it doesn't make it all the way. You got to let us know your plan now. I want to get a bag of popcorn and hear about the outcome. Good luck! 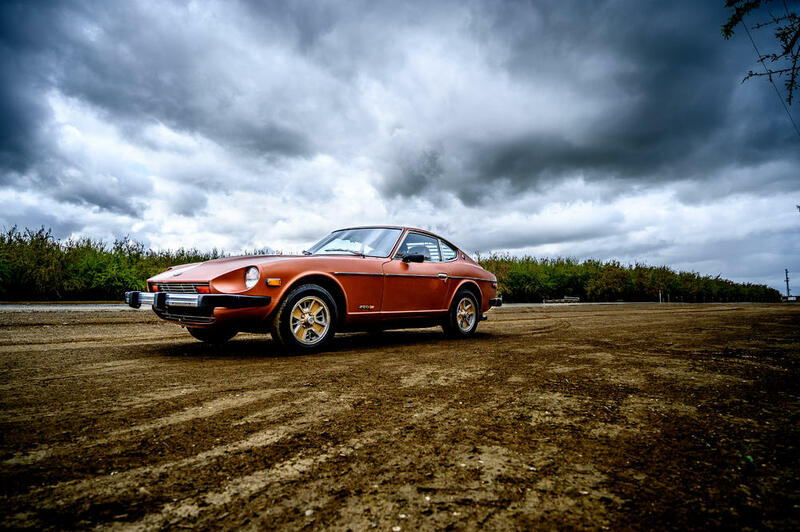 These cars have a reputation for reliability but 40 yrs of owner abuse is where they unknowns come into play. We made it back without a hitch! We took all of your recommendations and carefully inspected the Z and also brought tools, spare parts and fluids with us. We were willing to have it transported like some of you mentioned if we had any doubts but it drove really well. Just remembered that 77 has the space saver spare tire. Comes with a canister of air, to fill an expanding rubber tire, made of 40+ year old rubber. Most people switch to a smaller import "real tire and wheel. That is one thing that might be a trip killer. Flat tires are common. I don't know that I'd trust that tiny expanding thing in the spare tire well. Has anyone ever actually used one of those, after 40 years? Maybe take a can of "Fix-a-Flat". The brakes might just need bleeding. The switch, cleaning. I used this to redo my '77's combo switch. It's a little different but easy to figure out, more wires for the 280 if I remember right. Congrats, looking forward to more pics.